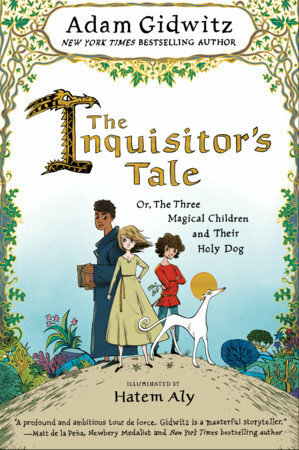 The Inquisitor's Tale, Or The Three Magical Children and Their Holy Dog by Adam Gidwitz, illustrated by Hatem Aly. Grades 5-9. Dutton Books for Young Readers, September 2016. 384 pages. Review copy provided by publisher. I loved this book so hard that I didn't want it to end, which is super high praise from me because finishing books and starting new ones is one of my very favorite things. The format reads like The Canterbury Tales with different narrators at a medieval inn trading off and telling the story of three children who are on a mission and who may or may not be saints (complete with miracles). It's a diverse group of children - Jeanne, a peasant girl who has visions of the future; William, a half-African student with super strength; and Jacob, a Jewish boy with healing powers. And each diverse role is specifically chosen to explore their role during the Middle Ages. This book says a lot about modern times while being exclusively set in the 1200s. So, in addition to being a rollicking adventure story with good doses of humor and occasional bloody violence, this is really a philosophy book. There's the question of morality - when you know something is right or wrong, where does that knowledge come from? There's the issue of hating people that are different than you are, even people you have never really met, and what that means and what can be done about it. But even though this book is totally thought-provoking and asks some hard questions that may get young readers to think about things that had never occurred to them before, it's still a rollicking adventure story. Tons of thought and research have obviously gone into this book. Man, I love it! For readers wanting more about the Middle Ages, try Good Masters, Sweet Ladies by Laura Amy Schlitz or Crispin: The Cross of Lead by Avi. For readers wanting more of Gidwitz's blend of humor, adventure, and bloody violence, try his Grimm trilogy, starting with A Tale Dark and Grimm. For readers wanting a thought-provoking philosophy book wrapped up in an adventure story, try ????? I have no idea, as this is pretty unique in my experience. Suggestions?! ?